Everyone will love this version of mashed potatoes! 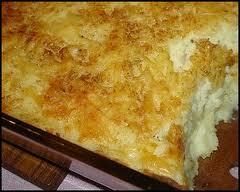 Treat you taste buds to creamy mashed taters combined with tangy cheese and a crunchy bread crumb topping! Preheat the oven to 400 degrees F. Coat a 13 by 9 by 2-inch baking dish with 1 tablespoon of butter and set aside. Cook the potatoes in a large pot of boiling salted water until they are very tender, about 15 minutes. Drain; return the potatoes to the same pot and mash well. Mix in the milk and melted butter. Mix in the mozzarella cheese and 3/4 cup of the Parmesan. Season, to taste, with salt and pepper. Transfer the potatoes to the prepared baking dish. Stir the bread crumbs and remaining 1/4 cup of Parmesan in a small bowl. Sprinkle the bread crumb mixture over the mashed potatoes. Bake, uncovered, until the topping is golden brown, about 20 minutes.